Near the Dominion Theatre was one of the most deprived areas of London, and the scene of the Capital’s most bizarre tragedy – the London beer flood. Before New Oxford Street was constructed the area behind Centre Point, the St. Giles area, was a rookery where some of the poorest of London lived in dirty, cramped conditions, and on the boundary of the rookery, on the site of the Dominion Theatre stood the Meux’s Brewery. A popular beer at that time was porter, a dark beer which originated in London during the early 18th century. Prior to that beer was distributed to the publican “very young” and aging was performed in the ale house, porter was the first beer to be aged at the brewery and dispatched to be drunk immediately. It was also the first beer which could be made on a large scale, and as it was invented in London and drunk by London’s porters it naturally became known as London Porter. Working in London’s markets were thousands of porters and manual labourers who would daily consume three or four pints or this dark heady brew that had an alcohol content of between 6.6 and 7.0% ABV. The brewing process of porter enabled producers to make it on an industrial scale, building ever larger vats to accommodate its growing demand. 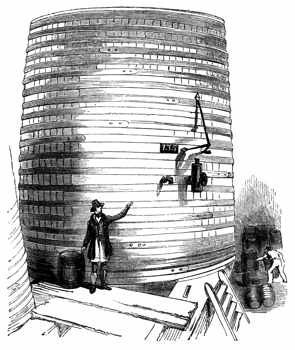 Meux’s Brewery Company had by 1795 vats 22-foot high that could contain 8.4 million pints of beer. So large were these barrels, upon the completion of a new one a reception would be held and one account relates that 200 diners sat down to a meal within its gigantean walls. This highly profitable enterprise came to an end on Monday 17th October 1814 at about six in the evening, when a corroded hoop on a large barrel prompted the sudden release of over 2 million pints of beer. The explosion could be heard some five miles away. It destroyed the brewery wall and badly damaged two houses. Some were drowned by the tsunami of beer and others were overcome by the fumes, while an even greater number hampered in rescue while using pots of collect this manna from heaven. The area, as today, was very flat and rescuers were sometimes up to their waists in beer trying to evacuate people from their basements. Some nine people died that day as a direct result of the accident, and one victim died some days later of alcohol poisoning; he had heroically attempted to stem the tide by drinking as much beer as was humanly possible. As with the way of the poor in those days, to try and make ends meet families displayed the victim in their house propped up in an armchair for inspection at a small fee. In one house so many crowded into the room that the floor collapsed, the spectators plunging into the basement, which was of course was full of beer. The smell of beer lasted for months and many lost their homes and livelihoods, while the Meux Brewery was taken to court over the accident, the judge ruled that the calamity was an Act of God with the deaths simply casualties. Italian revolutionary Giuseppe Garibaldi once said: “Bacchus has drowned more men than Neptune”. He could have been talking about 18th century London. Picture from Los Flowers’ Flickr stream.